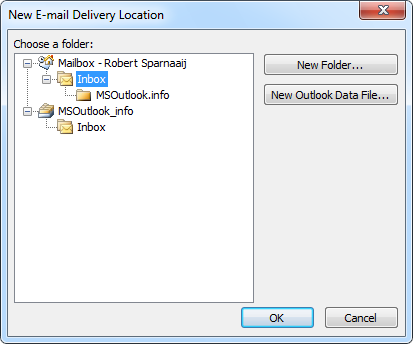 For Outlook 2007 and previous, when you configure multiple POP3 accounts in Outlook, all the emails will be delivered to the same Inbox folder. In Outlook 2010, Outlook 2013 and Outlook 2016, mail for POP3 accounts is delivered to their own dedicated pst-file. Outlook 2007 and previous can be configured to separate mail of different POP3 accounts as well. Also, Outlook 2010, Outlook 2013 and Outlook 2016 can be configured to use a single pst-file again without losing the indication by which account you received a message with. This guide introduces several techniques which you can use to sort your email based on the account you have received it with. While this guide is mainly focused on separating mails received from different accounts, the techniques can be used to sort mail based on other criteria as well. When you are using Outlook 2007 or later, you can directly set a delivery location for your POP3 account. This can be a single pst-file for all accounts but also a dedicated pst-file per POP3 account. When the account has its own folder set, all the emails are automatically stored in the corresponding folders without the need for configuring anything else like for instance rules. So your Sent Items are also automatically separated when using this technique. Select the POP3 account which you want to redirect to its own folder set. Press the”Change Folder” button at the bottom. Click on the image to see the dialog in full. When prompted for the type of data file, select “Office Outlook Personal Folders File (.pst)”. You may not be prompted at all if you don’t have multiple store providers installed such a for Business Contact Manager or iCloud. Give the pst-file a name and set the location where you want to store your pst-file. I recommend to store the pst-file in a location that is also included in your backups. See our Backup and Restore guide for more information on that. To lookup or change the names of your account see: Rename your accounts. In Outlook 2007, a new dialog pops-up to specify an Outlook display name for the newly created pst-file. Change the name if you please and press OK. I recommend naming it after your account name but this time you can leave out “.pst” at the end. Outlook 2010, Outlook 2013 and Outlook 2016 will automatically name it after the name of the pst-file but without the “.pst” part. Select the Inbox folder in the newly created pst-file. Press OK to close the New E-mail Delivery Location dialog. Repeat the steps to create additional folder sets for each account that you have. In contrast to using rules to separate your email, you’ll still be getting an envelope in your Notification Area when a new mail arrives. You can create additional folders and rules to further organize your mails. The accounts still share the Contacts, Calendar, Journal, Notes and Tasks folder of your main folder set. You can of course create additional ones if you want. Flagged items will also show up in the To-Do Bar. The changes are instant although you still need to move your already received emails. I would recommend creating a Search Folder for that in your original pst-file where the messages were received. With the same technique as mentioned above, you can also specify a specific folder within an existing pst-file (or even an Exchange mailbox) rather than a separate pst-file. This is particularly handy when you want to have a unified Inbox folder or use Search Folders all across you mailbox. You can set delivery to a single Inbox folder but also a subfolder of it or a new parent level folder. Select the POP3 account for which you want to change the delivery folder. Select an existing folder or create a new one. POP3 and Exchange account in Outlook 2007 and later. Auto Account Selection will not work in this configuration so when you create a new message, the sending account will be set to your default account rather than the account the folder belongs to. Using Message Rules is probably the most common method to sort your email. You can also create a rule that does something special to a message (like to move it to another folder) when it is being received via a specific account. 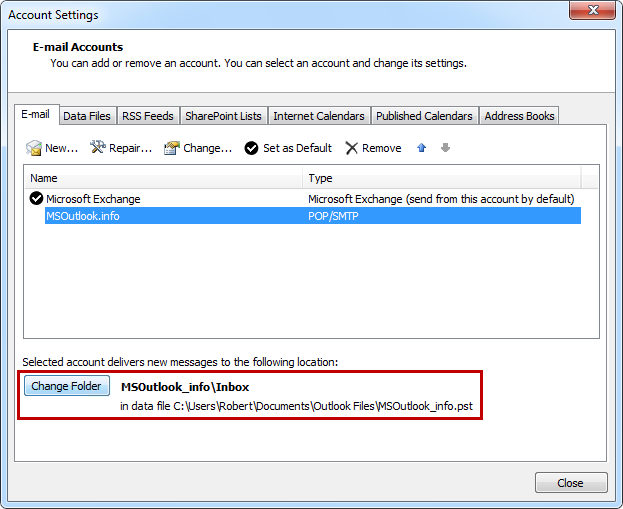 In Outlook 2003 and previous, this is the only way to deliver mail of a specific account to another folder or another pst-file. However, this rule condition can still be useful in Outlook 2007 and later as there are many other actions to choose from beside moving it to another folder. You’ll see the condition added to the bottom field. In the bottom field click on the word “specified”. Select the folder you want the email messages from that account to move to. You can also create a new folder. Naming the folder after the account name would be recommended. Verify that the rule is turned on. Repeat the steps to create additional rules for each account that you have. Press OK to close the Rules and Alerts dialog. Outgoing messages can be sorted by a rule in much the same way. You need to disable the default saving of outgoing messages first though. For full instructions see the guide: Sorting Outgoing E-mails. The changes are not instant as the rule will only execute for new mails that are being received after you have created the rule. If you want to sort the messages that you already have received you must manually execute the rule via the “Run Rules Now…” button in the Rules and Alerts dialog. If you don’t like separating you mails into different folders, a very easy and quick method to see which account was used to retrieve the email is by adding the Accounts column to your view. If you have a lot of fields enabled, you might need to add additional lines when you have “single-line layout” disabled (only applies to Outlook 2003 and later). You can set the amount of lines to use at the top of the current dialog. Enabling single-line layout works best when you have your Reading Pane at the bottom or when you have a widescreen monitor with a high resolution. OK yourself out of any open dialog. The changes are instant to the folder that you are in. If you want the column added to every folder you can do so by modifying the default Messages view or by applying the customized view to multiple folders at once. See the post “Applying views to all folders” for more details on how to do that. There is a special view setting which allows you to arrange your emails by E-mail Account. While on its own this might be a little clumsy when you have a lot of emails in that folder, it is a handy view setting when you combine it for instance with a Search Folder (like my “Today’s Unread Mail”) or a filtered view (when you filter on something different than the account). Use the button under the scroll wheel on the right side of the Gallery to expand it. The changes are instant to the folder that you are in. If you want the “Arrange By” setting to apply to every folder you can do so by modifying the default Messages view or by applying the customized view to multiple folders at once. See the post “Applying views to all folders” for more details on how to do that. If highlighting is enough for you, you can achieve this by using Automatic Formatting or Conditional Formatting. This way a mail from a certain account will be shown in a different color in your mail list. Press the Font… button to assign font properties to make the message strike to you. This can be a different font, a larger size, different text color or some text effects. Repeat the steps for any additional mail account that you want to highlight. You can use different font settings for each of them. The changes are instant to the folder that you are in. If you want the highlighting to apply to every folder you can do so by modifying the default Messages view or by applying the customized view to multiple folders at once. See the post “Applying views to all folders” for more details on how to do that. Creating a filtered view is a very flexible way of separating your POP3 messages received from different accounts. By using filtered views you can still receive all your mails to a single folder but have the benefit of hiding the mails from the other accounts. Name the view. The easiest is to name this after the account that this view will apply to. The changes are instant when you switch to a certain view. As we have defined our own view which applies to all mail and post folders, you can use this view in every folder within your mailbox or by applying the customized view to multiple folders at once. See the post “Applying views to all folders” for more details on how to do that. Search Folders is a technique that can be used in Outlook 2003 and later and are a great way to find all messages anywhere in your mailbox which match certain criteria. You can then manage these messages as they were located in the same folder and sort them with additional techniques like color coding. Custom-> Create a custom Search Folder. For instance, name it after the mail account it will apply to. In the Search Folder Criteria dialog, select the Advanced tab. Press the Field button and from the section “All Mail fields” choose “E-mail Account”. Set the condition to “is (exactly)” and set the value to the name of your email account. Repeat the steps to create additional Search Folders for each account that you have. The changes are instant when you select your newly created Search Folder. However, depending on the size of your mailbox, it could take a while before the view is constructed. To speed up the Search Folder, you can use the “Browse…” button when creating the Search Folder to select only the folders that receive emails. For instance, exclude your RSS folders and Sent Items folder. To customize a Search Folder, right click on it and choose “Customize this Search Folder…”.